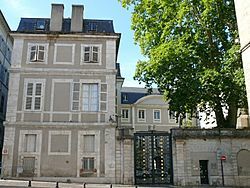 Lot (Occitan: Òlt) is a French department located in the Occitanie region of southern France named after the Lot river. Its prefecture and largest city is Cahors. Lot is one of the original 83 departments created during the French Revolution on 4 March 1790. It was created from the old province of Quercy. The new department had six districts: Cahors, Martel, Gourdon, Figeac, Montauban and Lazorte. The capital (now prefecture) was Cahors. In 1808, some of the original southeastern cantons were separated from it to form the department of Tarn-et-Garonne. It originally extended much farther to the south and included the city of Montauban. Lot is part of the Occitanie region and has an area of 5,216.5 km2 (2,014.1 sq mi). The Lot river crosses the department from east to west with numerous meanders. The Dordogne river flows through the northern part of the department. The Segala (northeast) occupies the eastern border of the Lot department. It is the part of the Massif Central that gets into the department and here is found the highest point of the Lot department in Labastide-du-Haut-Mont, with 783 m (2,569 ft) high. The Limargue (center east) separates the Segala from the Causses of Quercy. This narrow strip of land is found between the valleys of the Dordogne and Lot rivers. It is known as Terrefort around the city of Figeac. The Causses of Quency are several limestone plateaus crossed by the valleys of the Dordogne, Lot and Aveyron rivers. From north to south, they are the Causse of Martel, the Causse of Gramat and the Causse of Limogne. The Bouriane (west). This area is covered with an abundant vegetation and is very different from the near arid plateaus of the Causses. The Quercy Blanc (south) is formed by small white limestone plateaus along valleys where cereals, oilseeds (plants grown to produce vegetable oils), melons, plums and tobacco are grown. The Valley of the Lot river (south), with many vineyards and vegetable crops. The Valley of the Dordogne river (north), with its walnut groves and meadows. 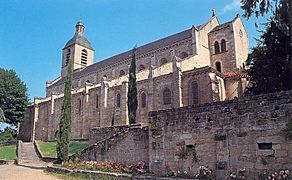 The department is managed by the General Council of the Lot in Cahors. Lot is part of the region of Occitanie. There are 3 arrondissements (districts), 17 cantons and 326 communes (municipalities) in Lot. The inhabitants of Lot are known, in French, as Lotois (women: Lotoises). Lot has a population, in 2013, of 173,758, for a population density of 33.3 inhabitants/km2. The arrondissement of Cahors, with 76,204 inhabitants, is by far the largest. 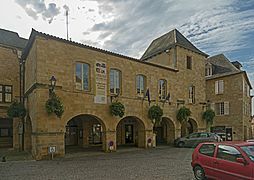 The other two, Figeac and Gourdon, have respectively 54,016 and 43,538 inhabitants. The city with more people living in it is the capital, Cahors (19,616). The subprefectures of Figeac and Gourdon have, respectively, 9,826 and 4,316 inhabitants. Lot (department) Facts for Kids. Kiddle Encyclopedia.